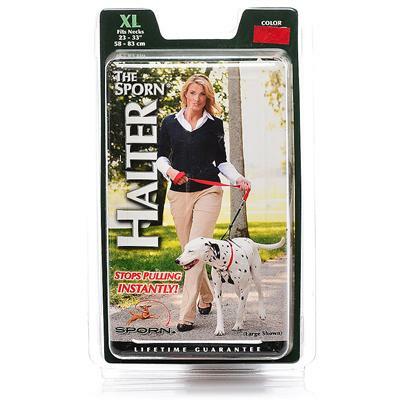 If your hands are sore from a constantly pulling puppy dog, you need the Sporn No Pull Halter. The Sporn Pull-Control patented design redirects the leash tension to the area behind the dog's front legs, a sensitive area where applying slight pressure by the Pull-Control restraints will stop the dog from pulling without discomfort. The Sporn Training Halter is made of the highest quality braided cord and nylon webbing with thermoplastic and nickel-plated steel fasteners. The Restraints are threaded through the fabric Sherpa Sleeves for your dog's comfort. You and your dog should enjoy walk time, and now you can! Follow instructions on packaging to ensure comfortable and secure fit for your dog.